Why not come and spend the day with us in the Lake District. We are looking at running the River Rothay , which is a very scenic, fairly fast flowing grade 2+ river interspersed with a couple of Lakes- finishing in Windermere, including Lunch on a deserted Island. 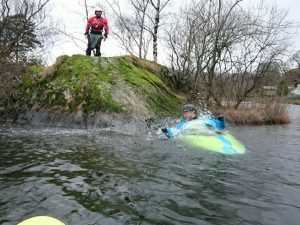 There should be plenty of opportunity for Eddy hopping, a play session in a Boulder Garden, A pretty cool Seal launch (see photo) and hopefully a glimpse of the elusive Otters which frequent the banks. Difficulty – Mostly a trip to admire the scenery with some sections of grade 2/3 and should be suitable for club paddlers with previous experience on grade 2 trips. Depending on water levels there may be some trees to dodge and Windermere can be choppy depending on Wind direction. If you plan to come on this trip, please let the listed contact know that you are coming -so that we wait for you and spaces ARE limited. Also plans may change at a later stage (due to water levels) so we might need to get hold of you . What do i need ? Normal paddling equipment (wetsuit/warm clothing not wetsuit shorts-and waterproof top, buoyancy aid, spray deck, helmet) packed lunch and hot drink (in a flask), snacks, change of clothing, towel and money for the after paddle social drink. If you are not sure whether you are proficient enough for this trip, please speak to the organiser who will be able to advise you.